this release takes a round through electronic music history - 2000-2007, electronica, ambient, house, techno. It’s one thing. max loderbauer and tom thiel aka SUN ELECTRIC were part of the initial revolution of electronic music. in the early 90ies they were one of the few artists (alongside e.g. THE ORB or KLF) who started to produce a sound that we call ambient or electronica music nowadays. SUN ELECTRIC released several albums and tracks on classic labels such as R&S/apollo or tresor, but after their breathtaking album "VIA NOSTRA" R&S vanished and so did sun electric. they re-formed themselves in berlin, turned towards laptop production and started to develop other projects like BUS (tom thiel) or NSI (max loderbauer). this year the berlin based label SHITKATAPULT released "LOST AND FOUND (1998-2000)", a cd with previously unreleased tracks from the last great period of SUN ELECTRIC - a rare document of surprisingly fresh electronic music. TONINAS, the first track of this album is now available as a remix 12" and the remix idea never made more sense than here::: remixing a decade of music ideas!!! everybody´s darling RICARDO VILLALOBOS built up a 128 club monument: a spaced out 128 bpm journey, 13 mintues long that shows RICARDO at its best: unresistable loop production, clear bassdrum fever and a crystal clear soup of sounds, glitches, musical thoughts that introduce an ocean of creativity. if you pay attentation you can find large pieces of the ambient piece AFTERGLOW, the final LOST AND FOUND album track, in the remix. 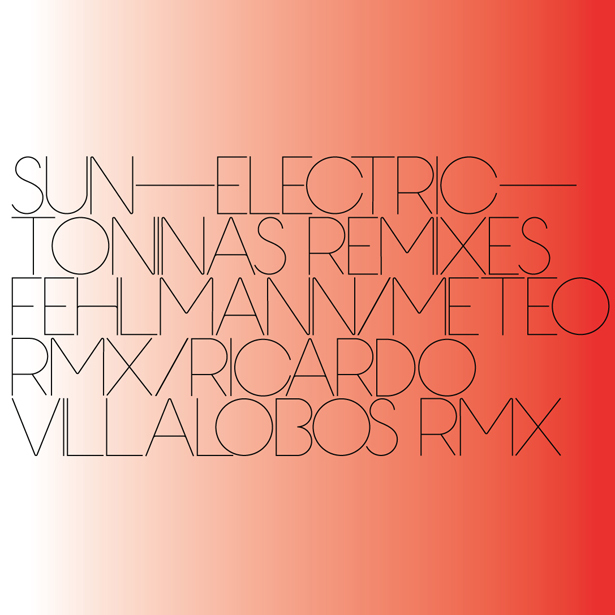 THOMAS FEHLMANN and DANIEL METEO showcase their first collaboration in the studio: their TONINAS remix is a fresh 120 bpm floor track deeply involved with the main SUN ELECTRIC production skill: creating, playing, flowing. and finds a way to push the great ambient msuic feeling of SUN ELECTRIC onto the floor..
the artwork is done again by MICHAEL C PLACE, creative director of london´s based BUILD company - who already did all designs for sun electric as part of designers republic back in the old days.